This photo of the Apollo 10 Command and Service Modules (CSM) was taken from the Lunar Module (LM) after CSM/LM separation in lunar orbit. Did Apollo 10 astronauts hear alien music coming from outer space when they orbited the moon in 1969? Despite what you may have heard on social media this week, or from the trailer for a certain TV show, the answer is no. It's true that the Apollo 10 astronauts heard strange whistling sounds that, at the time, they described as "outer-space-type music." But there's a very simple, nonalien explanation for what the crewmembers were hearing, and it's been public knowledge since the 1970s. Apollo 10, launched in May of 1969, paved the way for Apollo 11, launched in July of that same year, to put two humans on the lunar surface. 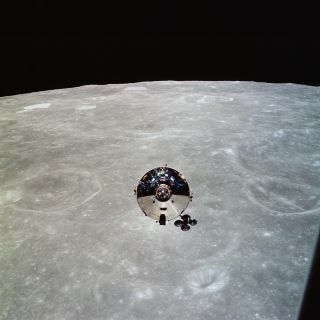 The Apollo 10 astronauts flew to the moon in a command module, and two of the crewmembers also took a ride in the lunar module, dropping down to less than ten miles above the moon's surface. The whistling sound, it turned out, was nothing more than interference between the VHF radios on the two different vehicles. Apollo 11 astronaut Michael Collins wrote in his book, "Carrying the Fire," that NASA technicians warned him about the whistling. Multiple publications have pulled the key passage from the book, in which Collins even says, "Had I not been warned about it, it would have scared the hell out of me." Collins' book was published in 1974. NASA put transcripts of the Apollo 10 transmissions online in 2008, although the documents themselves say they would have been declassified in 1982. NASA also put the audio files online in 2012, according to the NASA History Office. So why is social media suddenly bursting with discussion about this nonincident? Probably because of a Science Channel show called "NASA's Unexplained Files." A trailer for an upcoming episode discussed the "outer space music" and has the tone of a found-footage horror movie. It includes shaky footage of the vehicles, static-filled cutaways, anxiety-inducing music and sound effects, and a very alarmed-sounding narrator who refers to the whistling incident as "extremely unsettling." It's true that the astronauts sound genuinely awed and puzzled by what they heard, and bring it up multiple times. But at no point in the audio or the transcripts does the incident seem to raise an alarm with the three men. The documentary also puts particular emphasis on the fact that the whistling occurred while the astronauts were on the far side of the moon, where they lost radio and visual contact with mission control for about an hour (as expected). In an ominous voice, once again backed by music appropriate for a horror movie, the narrator says, "During this hour, the astronauts are on their own. No one on Earth can see or hear them." This works well to increase the anxiety-ridden atmosphere being created by the show, but the narrator never explains why the astronauts' isolation might be a significant factor in any possible theories about where the sound is coming from. What is interesting about the incident is that the three astronauts didn't discuss the sounds publicly (although it's unclear how much they discussed them with the engineers). But Sean O'Kane at The Verge postulates that the reason for the astronaut's silence was because the men didn't want to project anything but a rock-hard psyche. Any indication that they'd lost their confidence during a flight might get them grounded. The documentary trailer does bring up the radio-interference explanation for the sounds. However, the producers give the last word to Apollo 15 astronaut Al Worden, who "doesn't agree with the radio theory," the narrator says. In the documentary, Worden says, "Logic tells me that if there was something recorded on there, then there was something there." And ultimately, the narrator states, "To date, the origin of the noises mentioned in the Apollo 10 recordings remains a mystery." Aside from Worden's statements, the documentary offers no evidence to support that claim.